Fiction is a rare guest in the Bookworm's Cave, but I have a soft spot for Joanne Harris and when I saw her name on the 'new buys' rack in my local library, I simply couldn't resist. The thick volume was called Runelight and only back home I realised that it is actually part two of a new series, but it proved ok to read as a standalone title *sigh of relief*. You may have heard of Joanne Harris. Her Chocolat achieved quite a spectacular success when it was turned into a Hollywood movie starring Johnny Depp and Juliette Binoche. If you ask me, the filmmakers castrated the very decent piece of fiction, as they are prone to do, buy not everyone agrees. Oh well. I still cherish my tattered copy of Chocolat, but I have this funny feeling that it might be the time to re-read it again and perhaps become less enthusiastic. As I'm getting older, I'm less dazzled by bohemian vibes... On the other hand, who knows? Maybe the book will stand the test? Such deliberations are prompted by my being rather unimpressed by Runelight. Sure, it reads well. So well, in fact, that I missed my usual bedtime by a few hours just to finish it. Yes, definitely a page-turner. Mind you, harlequin romances read well too, but my commentary on their merits is 100% unprintable. 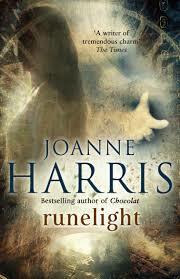 Runelight is not quite as bad, although it lacks the brilliance of Chocolat and that's the book's greatest crime. The story is set in some once-upon-a-time land, early medieval in appearance, and intensely meddled with by Norse gods. Yep, Odin, Thor, Loki, the whole bunch. Surprisingly, this much overused framework is the book's greatest asset. I'm not sure if I'm comfortable with Fenris the Wolf saying 'dude' all the time, but otherwise the celestials are really well imagined. Brought to Earth and sharply limited in their powers by events described in the book one (Runemarks) they provide decent amount of comic relief and are likable from the fist pages. Lines between hero and villain are pleasantly fuzzy: you're never sure who's going to pull a dirty trick but everyone is sort of decent anyway. Nice. Add some human (or almost human) heroes to the Asgardians and you'll end up with a crowd too numerous to control. Despite the book's brick-like dimension, the story is so full of protagonists that all this space is barely enough to stitch the story together and not much is left for developing characters. Then again, Runelight is more than slightly fairytale-ish in flavour and you don't expect Little Red Riding Hood to suffer from existential problems, do you? As to the rest, prophecies, quests, magical creatures and saving the world pretty much complete the picture. If you're searching for some light entertainment, Runelight is very much recommendable. Even if it is a far cry from the deliciousness of Chocolat.